Thirteen months ago, when I reviewed Eden's Curse's first work, I stated confidently that they were 'building a sure foundation ... at the start' and I predicted 'a notable future for Eden's Curse.' You know what? I was absolutely right! That's a damn good feeling to have. Eden's Curse's 'The Second Coming' is even better than the first and simply destroys the myth of a sophomore jinx. 'The Second Coming' is a brillant work of melodic rock and metal. When I listen to a new album I usually take notes as I listen. If a song stands out (for a variety of reasons), then I scratch a star next to the track number. Passing over the intro, there is a star next to most every song on this work. Yes, I was that satisfied! The compositions are solid melodic hard rock with a definitive metal edge basically supplied in the guitar work. Thorsten Koehne simply delivers supreme fret work. He shines on 'Masquerade Ball,' 'Raven's Revenge,' and 'Just Like Judas' just to name a few. Yet, just one more: 'Lost In Wonderland' is simply magnificent! Actually, I'm not sure who steals the show here. The aforementioned Thorsten Koehne completely satisfies this lead guitar loving critic. Micheal Eden is incredible: strong, steady and marvelously versatile. His duet with Pamela Moore (Queensryche) on 'Angels & Demons' is, well, amazing (as is Ms. Moore). Then there is the fundamental, often subtle, keyboard work of Ferdy Doernberg who is both progressive and old school. His presence is both sublime and formidable on pieces like 'Angels & Demons,' 'West Wind Blows,' and 'Man Against The World.' In the end, the whole band delivers with powerful musicianship. I want to make a special mention of the song 'Man Against The World.' Against the bravado and preachiness of Queen+Paul Rodgers' 'We Believe,' this song, though easily cliche, is much more believable. Although I do not believe in a secular solution to the world's problems, 'Man Against The World' suggest a more practical and plausible solution. And, frankly, the music is much better! Ha! 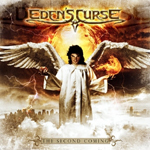 'The Second Coming' by Eden's Curse is simply and completely brilliant and enjoyable. One year ago I predicted a grand future for them based upon their initial release. This disc does not disappoint in the least: solid and majestic melodic rock and metal. Highly recommended!